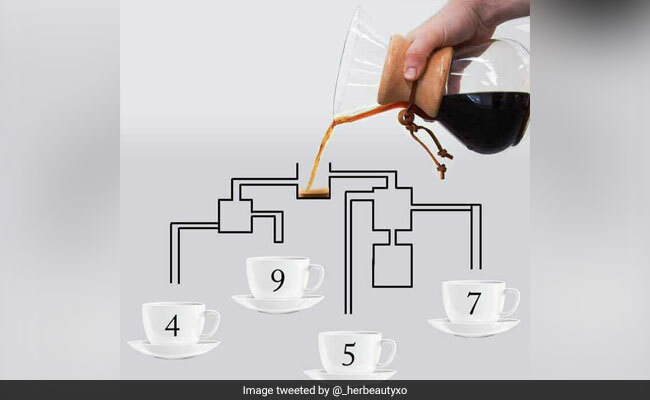 This Simple Coffee Pouring Puzzle Has Twitter Stumped. Can You Solve It? The internet is back with another mindbender. This time it's 'brewing' over a simple diagram of coffee being poured into a set of pipes leading to four cups. The memo is easy - which cup will get coffee first. But a "latte" people haven't been able to figure out the answer. Hint: Look at the finer details. Since being shared, the tweet collected nearly 2,000 retweets and over 4,000 likes. And all kinds of answers came up, mostly wrong. Wait no, 9 is blocked off. Okay, 4, 7 then 5 and 9... well, 9 just doesn't count. Some even gave a detailed explanation, thanks to Twitter's expanded character limit. But no, they are still wrong. I think the "speed" of the coffee being poured plays a role here. A "slow" pour would result in 5 getting the coffee first (as you pointed out) but a "fast" pour would result in an overflow spill from the top which would leak coffee into 4 & 7 before 5. Speed is relative. Like we said the answer was in the details. Cup number 5 will fill up first as the path to other cups has been blocked off. No science, just some observation skills were required for this one. You can find more of such puzzles and brainteasers here.